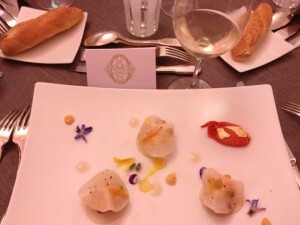 Tasting like James Bond with Bollinger and Ayala Champagnes / Update of tasting 2012s from barrel at Chateau Margaux and Palmer / Opening press dinner at Chateau Mouton Rothschild / Rainy but joyful “Tour de France” dinner tasting at Domaine de Chevalier with wines from Faiveley, Pol Roger, Zind Humbrecht and more / 15-vintage vertical and dinner at Chateau Haut Bailly / Vertical at Chateau La Lagune / Tasting the great wines of Paul Jaboulet, including 1990 and 1978 Hermitage La Chapelle / Most memorable tasting of rare 2011 Quinta do Noval, Nacional Vintage Port / Fine Chablis from Michel Laroche / Added notes to Bordeaux 2010 en primeur / And more! 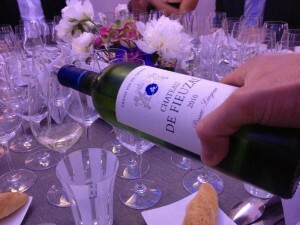 Vinexpo 2013 was an amazing week of fantastic tasting experiences ending with the celebrated gala dinner “La Fête de la Fleur” (the party to celebrate flowering) on June 20, 2013 at the Chateau Lagrange in Saint-Julien-de-Beychevelle. Although I joked that it more like a Shattering Party, because of the poor weather affecting the flowering in the vineyard… Still, the event also marks the end of Vinexpo, the world’s biggest wine and spirits fair gathering 45,000 professionals from around the globe. It included high profile guests, from former French soccer player Christian Karembeu to celebrated French actress Carole Bouquet. You can catch a glimpse from THIS VIDEO. 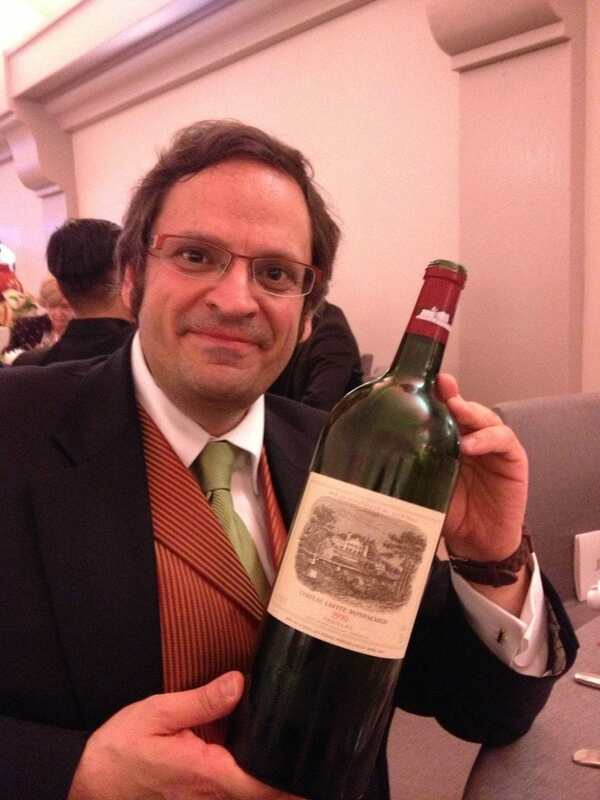 Chateau Lagrange makes some of the best wines from Saint Julien especially in terms of price/quality ratios – so important from Bordeaux, whose higher end wines have become sometimes absurdly expensive. 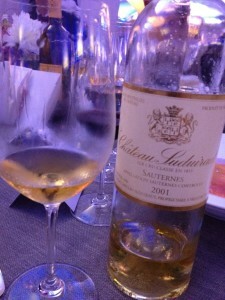 Owned by the Japanese company Suntory since 1983, the chateau went to great lengths to make the dinner a smashing success, including clearing out barrels to create an amazing dinner space that resembled an enormous first class airport lounge from some top airline. Some 1,500 guests – women in evening dresses and high heels, men in tuxedo black tie – walked a red carpet to reach the chateau’s cellar/barrel space converted to seat the diners. Because of the inclement weather, the chateau also arranged shuttle services from parking areas so that guests need not worry about walking in the mud. 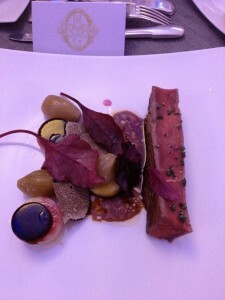 Michelin chef Frederic Simonin’s food provided a superb match for the great wines enjoyed. His lobster slices between ravioli daikon, Aquitaine beef with grated summer truffles and other delicious delicacies were served in the finest of China. The wines – including Chateau Lagrange 1995 from magnum and Chateau Lafite Rothschild 1990 from magnum – were served in fine crystal. Links – see below – will be activated throughout July. Update of tasting 2012s from barrel at Chateau Margaux and Palmer / Opening press dinner at Chateau Mouton Rothschild / Rainy but joyful “Tour de France” dinner tasting at Domaine de Chevalier with wines from Faiveley, Pol Roger, Zind Humbrecht and more / 15-vintage vertical and dinner at Chateau Haut Bailly / Vertical at Chateau La Lagune / Tasting the great wines of Paul Jaboulet, including 1990 and 1978 Hermitage La Chapelle / Most memorable tasting of rare 2011 Quinta do Noval, Nacional Vintage Port / Ayala and Bollinger Champagnes / Fine Chablis from Michel Laroche / Added notes to Bordeaux 2010 en primeur / And more! Vinexpo, the international wine and spirits exhibition, broke all records for the number of non-French visitors at its 17th show last month. Almost 38% of the professionals who visited the exhibition, travelled from all over the world to be there. In five intense days, featuring very active exhibitors, top flight tastings and quality business contacts hailed by the attendees themselves, Vinexpo clearly demonstrated why it is the world’s leading professional wine and spirits gathering. 48,858 visitors from 148 countries were counted going through Vinexpo’s entrance gates in 2013, a slight 1.5% increase compared to 2011. While the number of French visitors remained stable between the two years, non-French visitors increased by 3%. In fact, a new record was set as the number of visitors arriving from outside France reached 18,462, representing a 37.8% share of the total. 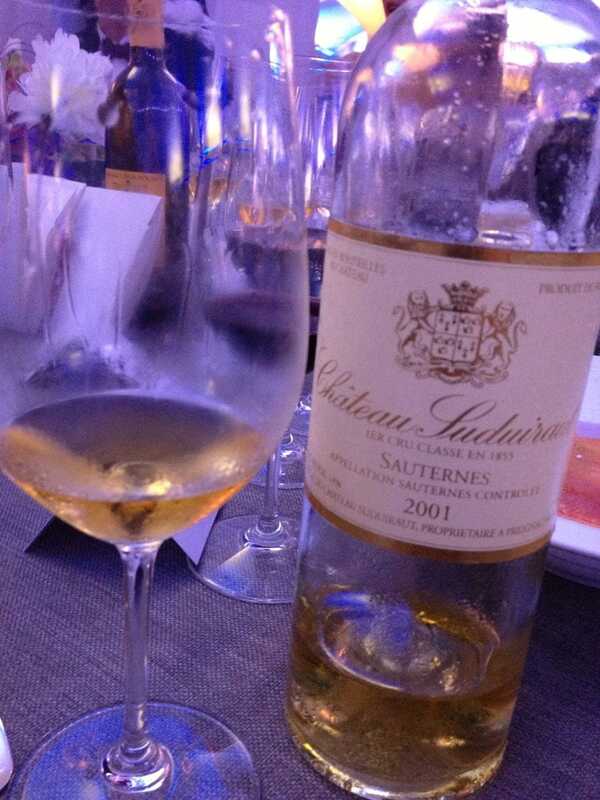 Asia with its booming markets clearly demonstrated its interest in wine and spirits at Vinexpo 2013. 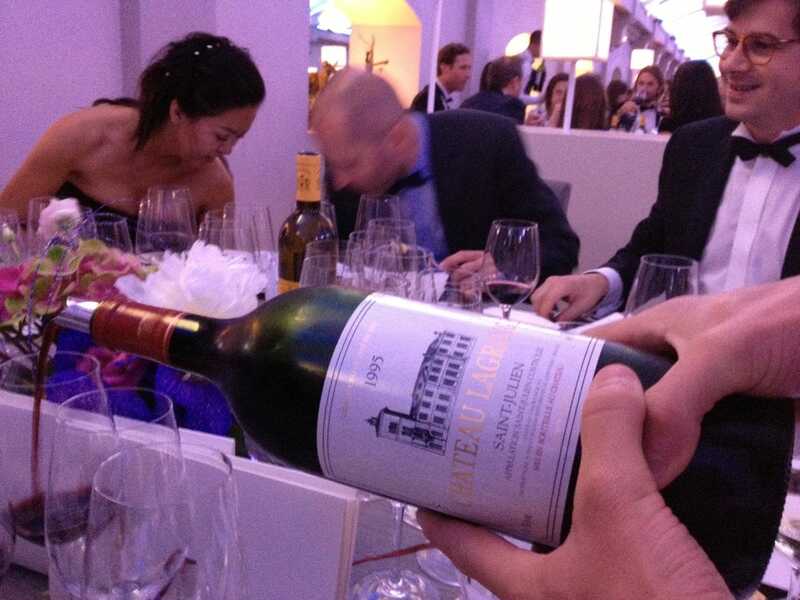 China led with 3,388 professionals and became Vinexpo’s largest non-French visitor, up 13.9% compared to 2011. Japan, where wine consumption continues to grow regularly, was very well represented this year with 427 visitors, up 17.63%. And beyond these two leaders, Vinexpo attracted more and more Asian visitors: India, up 32.7%, Taiwan, up 4.5%, Vietnam, up 20.4% and Malaysia, up 21.1%. The U.S., the world’s leading wine-consuming nation both in volume and value, was Vinexpo’s second largest international visitor with 1,433 professionals. Canadian visitors were on the increase with 731 professionals, up 11.9% compared to 2011. Despite the established concentration of American and Canadian distribution networks, more than one foreign visitor out of ten came from North America. The 4th, 5th and 6th largest visitor countries at Vinexpo 2013 were UK with 1,418, Belgium with 1,132 and Germany with 1,073 professionals respectively. Amongst the nations, whose professional representation showed significant growth, Russia also featured with 9.8% more visitors than in 2011. Europe’s import destinations were very present. After UK, Belgium and Germany came the Netherlands and Switzerland with 827 and 552 professionals respectively followed by Finland, up 11.9%, Austria, up 55.7%, Denmark, up 32% and Norway, up 12.9%. The major European producing nations, Spain and Italy, were also well represented by buyers, especially from hyper- and supermarket chains. Visitors from France accounted for 62.2% of the total and represented all sectors of the industry: wholesalers, hyper- and supermarket buyers, restaurateurs, sommeliers and specialist retailers. These statistics confirm our forecasts with regard to world markets. “Between 2012 and 2016, wine consumption will grow by 145 million 9-litre cases worldwide, an increase of 5.31%. Three markets in particular will drive this growth: the U.S. with an extra 40.5 million cases, China, up 70.5 million cases and Russia with a further 17.4 million cases,” pointed out the Chief Executive of Vinexpo, Robert Beynat. Only Vinexpo displays such a wide variety of products and represents world production so comprehensively. 2,400 exhibitors from 44 countries and many more producing regions and appellations put their wines and spirits on show with stands that covered a total floor area of 40,000 sq. m (430,500 sq. ft). In just a few steps, visitors could move from France to Chile and on to the US and Italy or from Germany to South Africa, from China to Japan or even from Georgia to Lebanon. The tastings and presentations branded “Tastings by Vinexpo” enjoyed lively support, being attended by 14,700 professionals, who sought introductions to new products, opportunities to improve their knowledge or hear the views of internationally acclaimed experts. 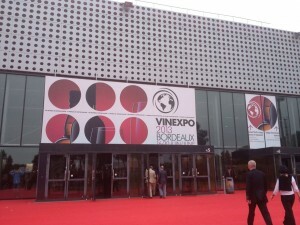 1,290 journalists from 54 countries paced the Vinexpo aisles. The exhibition’s Press Centre was a hive of activity and the impact in the international written press as well as the radio and television coverage, reflected the media buzz that was palpable throughout the show. Vinexpo Overseas, whose success in Hong Kong is unanimously recognised, will extend its activities in Asia. This expansion will serve the needs of wine and spirits professionals in these high potential markets. The international wine and spirits exhibition, which is a major event in Asia, will again be held in Hong Kong on 27, 28 and 29 May 2014. The 8th Vinexpo Asia-Pacific will be larger than ever before. In order to respond to the substantial demand from exhibitors the overall floor area for stands will be increased by half to reach 15,000 sq. m (over 160,000 sq. ft). Vinexpo Overseas will reach out from its firm base in Hong Kong to launch “Vinexpo in Beijing”. 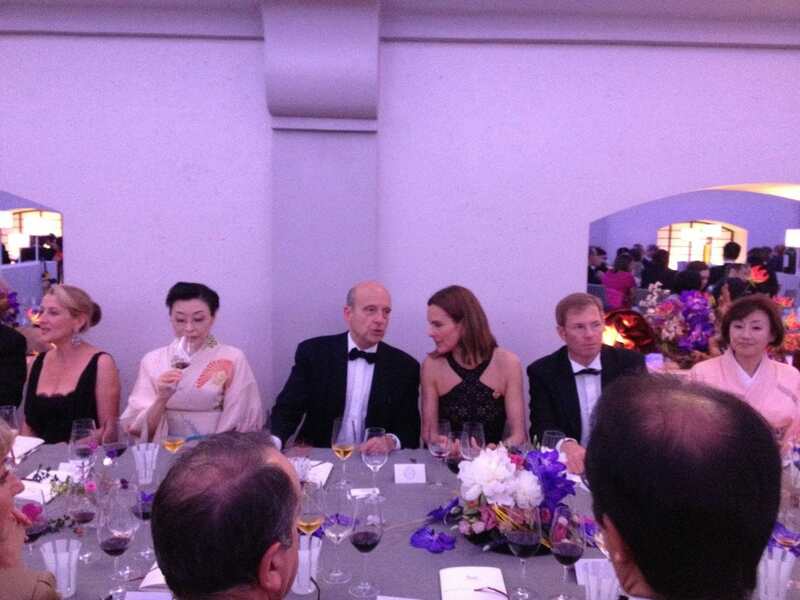 “Vinexpo in Beijing” is an extension of Vinexpo Asia-Pacific. It is an additional opportunity for exhibitors, where everything will be organised to make it feasible for them to set out and display their offerings before the trade professionals of north-east China. In the face of overwhelming demand from Japanese professionals, Vinexpo Overseas has decided to respond to the requests of Japanese importers and organise a totally unique event in Tokyo. It will take place on 1 and 2 November 2014 at the Prince Park Tower Tokyo in the Japanese capital’s city centre. This “Business to Business” exhibition will address the full range of Japanese distribution channels, with a special focus on the On-trade (cafés, hotels, bars and restaurants). The main Japanese importers will be especially involved in the show and will be able to share stands with loyal Vinexpo customers. A total of 400 stand spaces will be on offer and 4,000 visitors are expected to attend.